I spent part of yesterday afternoon browsing through the excellent collection of design and typography books in the library of the Danish Museum of Art & Design here in Copenhagen. Among them was Typologia, a 1940 book by Frederic Goudy. 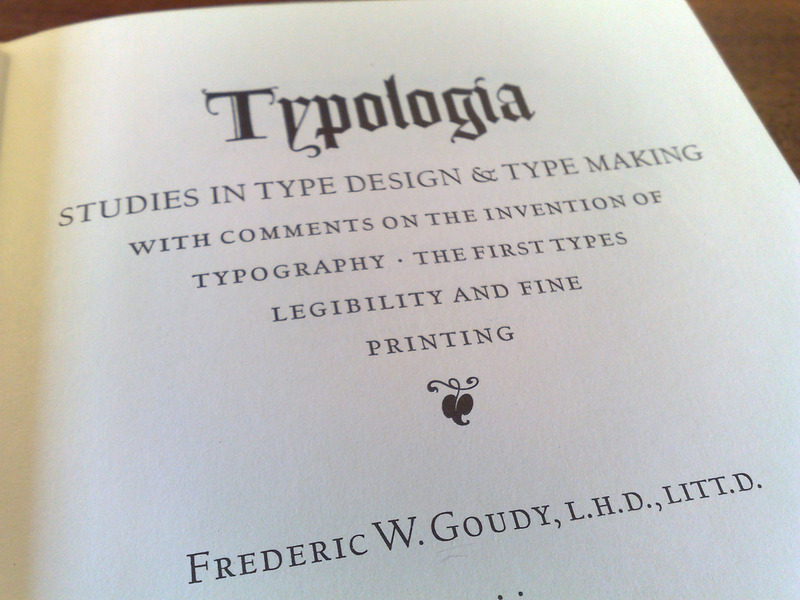 Subtitled “studies in type design & type making : with comments on the invention of typography : the first types, legibility and fine printing,” the book is most remarkable for the wonders of its own typography. Set in University of California Old Style, it is a testament to the trade, and is almost enough to make me recant my digital lifestyle and return to the analog world of print production. A portion of the book, albeit in ugly browser-rendering, is available for reading online. Written September 25, 2009 at 7:15 p.m.